Settlers at Them ïew Mawlong in Shillong on Wednesday staged a protest as Meghalaya Government officials carried out a land survey in the area. Earlier, the High Level Committee constituted by the State Government had asked the Directorate of Land Records and Survey to conduct a survey of the area and complete the same within ten days. The protesters assembled near a petrol pump and showed placards which contained writings against any move to relocate the settlers. 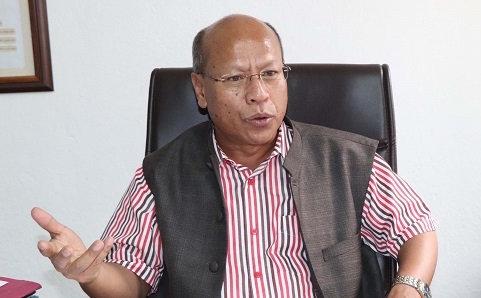 Meanwhile, Deputy Chief Minister Prestone Tynsong on Wednesday said that leaders of the Sikh organizations should not make an issue out of the government’s move to find solution to the problem related to Them ïew Mawlong. He also appealed to all to have faith in the State Government which has constituted the High Level Committee to examine all records and documents, and recommend feasible solution on the pending demand to shift settlers from Them ïew Mawlong. “Please don’t make this as an issue. The intention of the State Government is not to displace the settlers residing at Them ïew Mawlong,” Tynsong told reporters here on Wednesday. On Tuesday, a seven-member delegation of Shiromani Akali Dal from Delhi visited Them ïew Mawlong and met Tynsong, who is also the chairman of the High Level Committee and expressed their opposition to the constitution of the high level committee. They also suggested the State Government to focus on rehabilitating the settlers instead of relocating them from Them ïew Mawlong. Tynsong had told the delegation, not to have any apprehension on the motive and intention of the State Government to address the long pending issue.